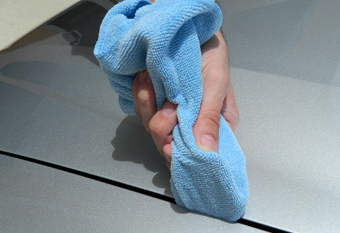 How many times have you spent HOURS or DAYS (it’s true – a detail can take days if the vehicle is bad enough!) meticulously polishing and waxing your vehicle, only to have a friend or neighbor point out the embarrassing fact that you accidentally left traces of wax or polish in between body panels? Say goodbye to crusty wax and polish residue and say hello to the Wax Removal Tool Combo! The Wax Removal Tool is a plastic scraper that is thin enough to fit in between body panels and trim seams, making it possible to safely remover crusty wax and polish residue. How does it work? 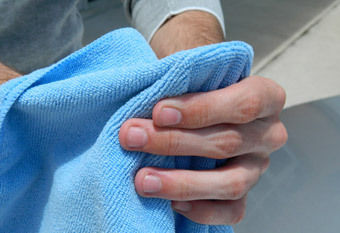 Simply wrap the Wax Removal Tool with the included microfiber towel, place it between a body panel or trim seam, move the scraper back and forth (while wrapped around the towel still) and voila! 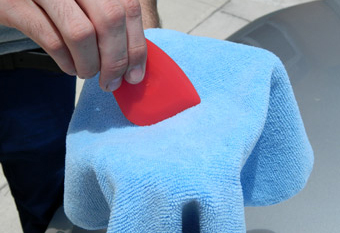 You now have a quick, easy, safe way to remove wax and polish residue. Best of all, you don't have to worry about scratching your paint. 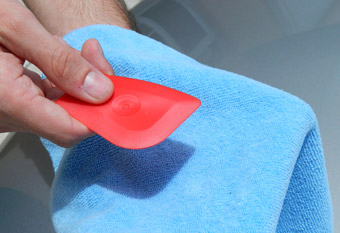 The Wax Removal Tool also comes in handy for removing stubborn stickers or dealership emblems. The tapered edge will help pry and lift unwanted stickers and emblems without scratching. Use with 3M Adhesive Remover for stubborn emblems. Includes 2 Wax Removal Tools and one 16 x 16 microfiber towel. I have used this tool once and I like it a lot. It may seem simple, but the device has many curved corners and thicknesses. This helps to get the wax buildup or dirt out of trim edges; that before now were hard to get at. Plastic tool is beveled to allow the towel to get in between panel gaps of varying size and it does its job pretty well. However, I think if offered separately as a single piece for $1.00 or so would be the best buy, since you don't really need two of them as I don't anticipate one breaking and, well, we all probably have tons of towels. Glad I picked this one up though.